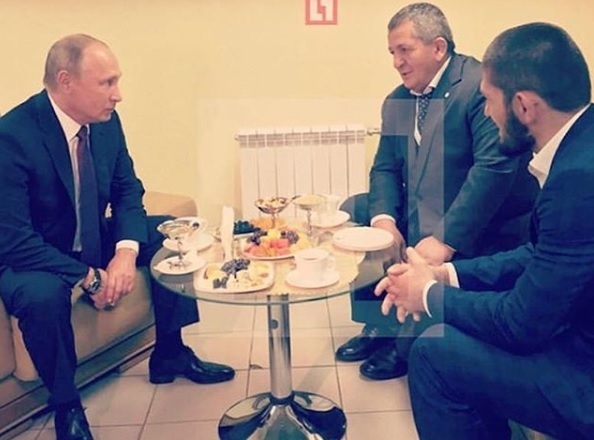 On October 10, 2018, mixed martial arts superfighter Khabib “The Eagle” Nurmagomedov, 30, of Dagestan, Russia met with Russia’s President Vladimir Putin, 66, in Ulyanovsk, Ulyanovsk Oblast, Russia. This was days after the former successfully defended his UFC Lightweight Championship title for the first time. The reigning UFC Lightweight Champion’s father and head coach Abdulmanap Nurmagomedov, 55, was present during the meeting. Prior to this, the father of the undefeated fighter said on Russian TV that he would punish his son due to his misbehavior during his successful title defense. On October 6, 2018, Khabib defeated his challenger Conor “Notorious” McGregor, 30, of Dublin, Ireland in the main event of “UFC 229” at the T-Mobile Arena in Paradise, Nevada, United States. A chaos ensued when the two engaged in a post-fight scuffle, which started when the Dagestani superfighter attacked McGregor’s cornerman Dillon “El Jefe” Danis, 25, of New York, United States followed by McGregor’s attack to Khabib’s cousin Abubakar “Dagestani Gangster” Nurmagomedov, 28, his cornermen Zubaira “Warrior” Tikhonov, 27, and his cousin Esedulla Emiragaev. Tikhonov is also a UFC athlete while Abubakar is currently signed with Professional Fighters League. Emiragaev is a Sambo and MMA coach. Khabib has apologized to the Nevada State Athletic Commission explaining that what he did was a response to how McGregor insulted his family, his country and his religion. Prior to the “UFC 229” fight night, the Dublin native and his team repeatedly trash-talked the Dagestani fighter. According to Khabib, he heard a number of insults from Danis during the “UFC 229” match against McGregor, which included anti-Muslim. Danis, who is a Bellator MMA athlete, has denied this.